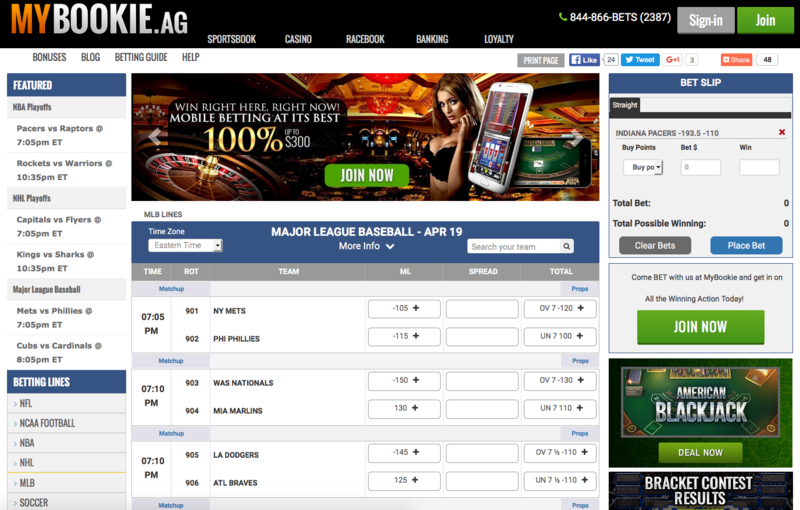 MyBookie.ag is a relatively new online sportsbook that has been online since 2014. 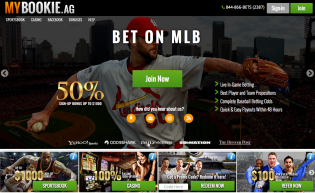 While still very young compared to more seasoned sportsbooks like BetOnline or Intertops, the site has garnered a decent following of sports bettors. The company itself is located in San Jose, Costa Rica, while the sportsbook’s servers are based in Canada. There was slight controversy over the initial opening of MyBookie.ag, as rumors were confirmed that some of the management team were former BetOnSports executives, which went belly under a few years ago. However, the public has since moved on from that, with SBR even bumping their rating up to a “C” grade recently. As far as betting is concerned, MyBookie.ag is a full-service sportsbook that also offers an online casino and racebook for its clientele. It would seem their main focus is definitely geared towards American bettors, as it has a wide selection of North American sports lines for all the major sports leagues, as well as soccer and tennis. 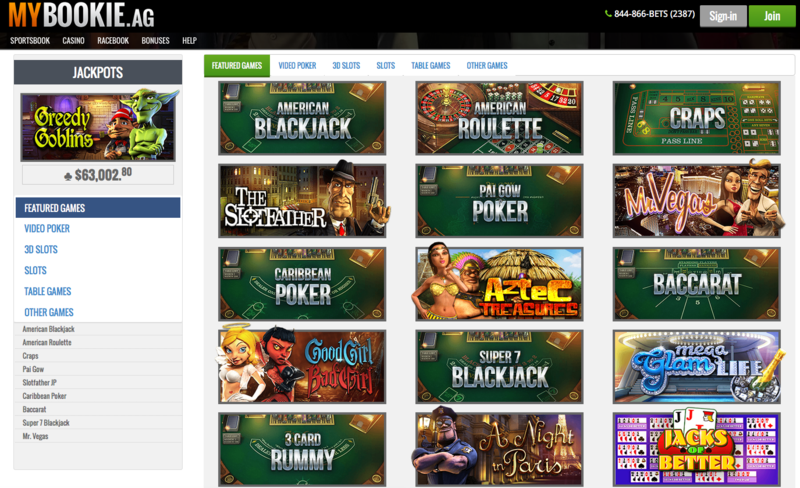 The site still takes gamblers from all over the globe, with new players being eligible for a 50% bonus up to $3,000. Very responsive website and easy to navigate, place bets and check existing tickets. Great deposit bonuses for sportsbook & casino, with 7% rebates on horse racing bets. Great site for exotics, props and futures. Limited selection of sports markets available. Bets limited to $1K max - most likely done to steer away "sharps." Few deposit and cashout options available. 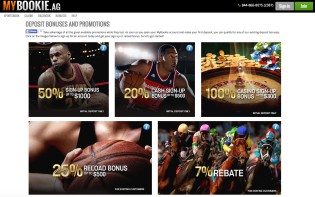 One of the best features of this site is the large deposit bonuses they offer, this sportsbook has lots of options with deposit and withdrawal and a solid 20% Sign Up Bonus Up to $500. But the sign up bonus most opt for is the one MyBookie offers to new sportsbook players currently. 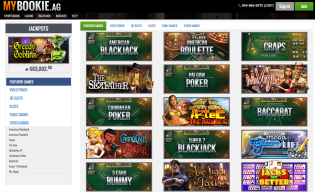 It’s deposit bonus of 50% Bonus up to $3,000 in freeplay funds. To get bonus in its entirety, there is a 15X rollover. This bonus is applies to all players who make their first deposit for sports betting. The catch is that you can’t make a cash out within 30 days of taking part in this promotion, and also the freeplays are only valid on moneylines bets where the line is between -200 and +200. This is valid up to $500 and the playthrough is 5-15X all depending on how much you deposit. This is probably one of the best interfaces out there when comparing to any of the US-facing sportsbooks. You can put straight wagers and choose a few selections for multiple bets, and it’s so easy that it makes betting fun and exciting. 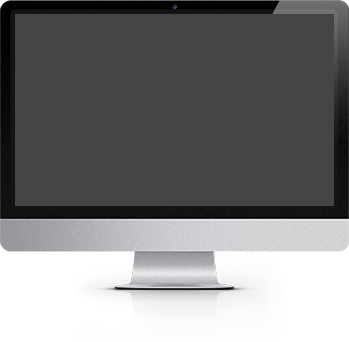 The software is super user-friendly and that’s why many like it. It is focused on the North American and US sports markets and does not have much on offer for international sports but they do have odds on some English Premier League and La Liga soccer games, alongside MLS and international matches. It’s easy to navigate and filter through, even allowing bettors to wager on props, futures and more. 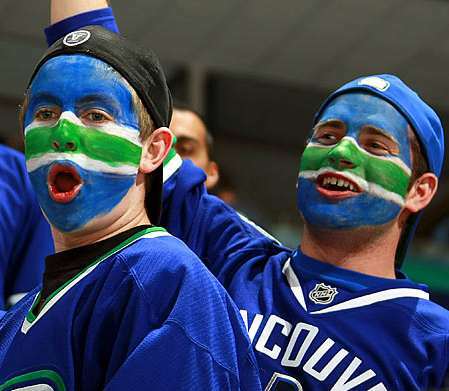 MyBookie.ag offers lines pricing on several sports, with most of them being more North American-friendly. These include major sporting leagues like the NFL, NBA, NHL and MLB – along with NCAA Football, soccer, tennis, NASCAR, Boxing/MMA and horse racing. Like most popular USA-centric sportsbooks, the most popular betting markets are based around the “Big 4” of sports leagues – the NFL, NHL, NBA and MLB. This bookie is geared towards the North American market and that doesn’t look to change any time soon. Sports like NCAA mens football, tennis and international soccer are also huge draws for not just American bettors, but global punters as well. There are decent dime lines available on these USA betting markets, but for the most part they are pretty standard in comparison to other bookies online. These lines include pricing at -150 to -180, especially when overnight lines are released on their website. The most popular sports being wagered on by international punters include NFL and NCAA football, tennis and of course international soccer. The fact that MyBookie.ag features so many different leagues in so many different countries for their international soccer games, it is with no surprise that soccer games are the most widely bet by global customers. Unfortunately, with so little international sports being offered at MyBookie.ag, there really aren’t a ton of options available for the international betting community besides the major sporting leagues and soccer matches. The site would be better benefited if they added more sports like Aussie Rules football, Euro basketball, cricket and more. They offer some cool types of bets from round robins to if-bets and reverses, and they have a pretty good list of futures for all of the major professional sports in the US. But there are some rules to betting on sports, they have no maximum betting limit if you call in by phone, but their maximum online is $1,000. Compared to other sportsbooks $1,000 maximum is pretty low, so it’s obvious that this sportsbook is completely focused on the recreational players. MyBookie.ag’s betting limits range from $10 to $1,000. It’s kind of odd, since most sportsbooks take bets as low as $1. And as many other sportsbooks have much higher max limits, usually around the $2-$3,000 mark, not $1,000. But there is one exception, if there is a bettor who has more money in their account, and are willing to make the bet over the phone, MyBookie.ag lets you bet as high as you want. Props and Live Betting for limited sports including NFL and NCAA Football. They also offer individual futures and props options for certain sports and events. The site also offers unique exotic bets in entertainment, business & politics, as well as religion. This includes action on the Presidential races, WWE wrestling events and even eating contests around the world. 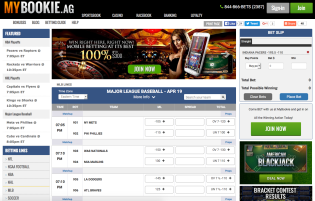 Although they offer such a limited amount of sports markets, MyBookie.ag does hit good marks on the types of odds and lines prices in their sportsbook backend. Dime lines for certain sports can creep up to around -180 to -185, with standard pricing staying along the industry standard at -100 to -120 on favorites. You can also buy points on most of the major sports to minimize risk quickly and easily from their website. Props are also available next to each game, but sometimes overnight lines may not reveal those individual props prices until closer to actual game time. Horse bettors also earn 7% cash rebates on all their action. MyBookie.ag also allow live in-play betting on certain sports and I will say it is one of the more favorable sites that allow good lines for such wagers. It keeps it very interesting, especially since even the most avid sports fans are also keeping up with these games because they’ve either wagered on the game before start time or are looking to bet on action during each quarter, period or half for these events. Making a deposit is pretty easy and us mostly standard. They accept Visa and MasterCard and they also offer Western Union and MoneyGram and bank wires. There is no charge for Visa and MasterCard deposits, no matter the amount and MyBookie will reimburse fees for players if their WU, MoneyGram or bank wire is $300 or more. That’s a great deal and much cheaper fees than most sportsbooks. MyBookie has a min of $50 USD all the way up to a $5,000 USD max, all depending on which method you choose to deposit. The only downside is that they don’t accept deposits/payments by e-wallet. No matter which payout method you choose, the processing time according to their time frames listed on their cashier page is 2 days. But when looking at some complaints posted online, there are issues. But payouts are getting paid to players within two weeks in most cases no matter which withdrawal method you choose. Those are not fast rates but still they are in the above average range when it come to online sportsbooks servicing Americans. It’s important to note that MyBookie.ag also only processes payments Monday through Friday with a min of 48 hours to process your cash out and the min cash out amount is $100, where you have to roll your deposit over 1X before you’re able to do it. The max cash out per week is $2,000. As you can see, it’s not a flat-rate like most gambling sites offer, it’s a range, where what you pay goes up the more you cash out, which is not ideal if taking out large amounts. MyBookie.ag, for all its faults and shortcomings regarding its banking options, does have a pretty solid mobile betting platform to go along with their standard desktop site. You can access your account, scroll through lines, place wagers and check existing betting slips straight from your smartphone or tablet. The great thing is that you can bet from your smartphone anytime, anywhere with MyBookie’s mobile betting site. Any handheld device works (iPhone, Android, or any internet enabled mobile device), just log into your account and start betting, you don’t have to download anything. With no download necessary to access the mobile version of MyBookie.ag, you simply need a smartphone and your mobile browser to access anything you need to make a bet. You can literally place a bet 24 hours a day, 7 days week from your favorite device such as an iPhone, Galaxy, Blackberry and more. As long as it’s got a browser you’re on your way to making mobile bets or live in-play wagers in no time.